It's a sobering thought: I have, most likely, about three more months to finish any projects before our next baby arrives. Yikes! So I need to get realistic about what I might truly be able to accomplish, despite my wishing to do more. 1. 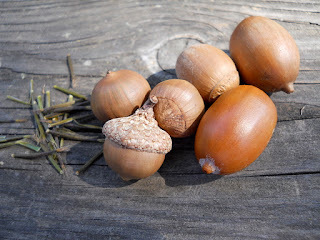 Make acorn critters with my kids. 2. Cover four chair seats with new fabric. 3. Set up and use my grandma's White sewing machine. 4. Sort my photos and scrapbooking supplies. 5. Finish Dallas Willard's book, Knowing Christ Today. 6. Complete 31 Days to Clean: Having a Mary House the Martha Way. 7. Make homemade marshmallows without corn syrup. 8. Bake homemade pumpkin granola. 9. Replace an old shower curtain liner. 10. Observe classrooms at local elementary school/s. What's on your fall agenda? Glad to hear that someone is focusing on their photos! Also - yummy - homemade marshmallows! I've been wanting to do that for some time now, maybe I can add it to my 31 Days of Handmade Christmas Gifts?!? Thanks for stopping by my blog! Hello! Just came across your blog! I appreciate your lists and expectations to accomplish them! Homemade marshmallows? Wow! Would love to hear how that goes! Also enjoyed reading down thru your menus! Thanks for the ideas! I really want to finish a scrapbook I'm making for my grandmother, and learn some new fall dinner recipe's. Love yours! Would love to know your recipe for homemade marshmallows! @Vicki--I will try to post the marshmallow recipe soon. Hopefully I can try making them next week. In some posts I may choose to link to books or other products in association with Amazon. Futher details can be found here.